This stylish and contemporary 36" high bar unit encompasses a design that is ideal for entertaining your guests. It features two doors where you conveniently find a place to hang glasses and a wine rack that can store up to 15 wine bottles. Its shelving area is great for making cocktail or displaying bar accessories. This cappuccino finished, solid-wood unit is practical, elegant and a must-have in every home! Outdoor Bar With Storage Keep everything right where you need it. 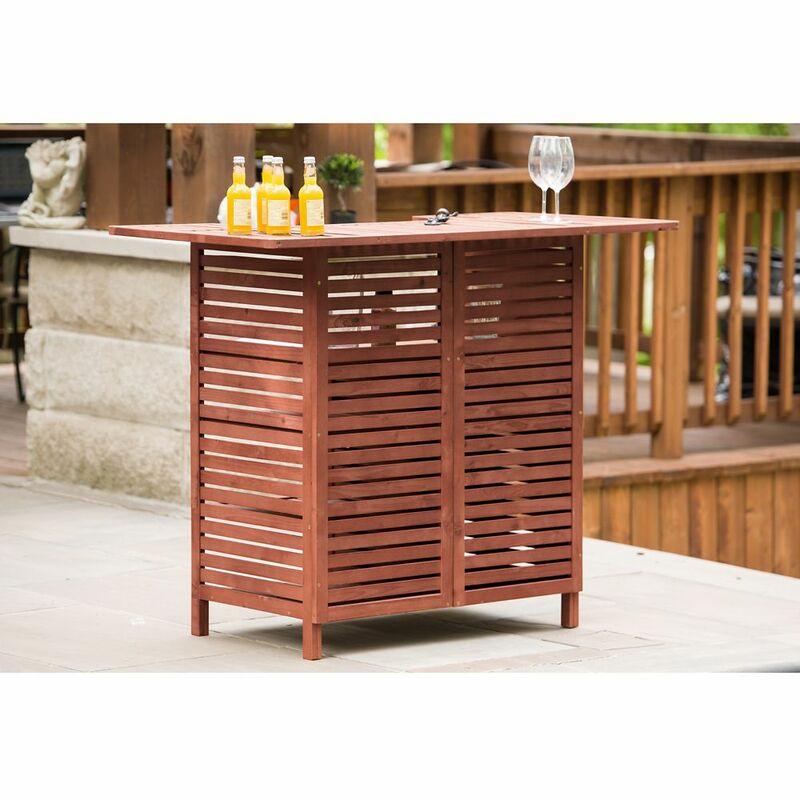 This outdoor bar with storage was designed for entertainers who treasure practicality and style. Just about everything but a butler is included built in serving island, over-sized utility drawer, enclosed cabinet, adjustable shelving and ample open shelf-storage. Perfect for snug spaces. Blends easily with existing lawn and garden furnishings. Can also be used as a buffet table or hobby workstation. Crafted of solid wood harvested from the Cypress tree family with decay resistance similar to Western Red Cedar. Outdoor Bar With Storage is rated 2.6 out of 5 by 10. Rated 1 out of 5 by jk from Item was broken in the box. ... Item was broken in the box. Rated 3 out of 5 by Robert from The bar is an example of getting what you pay... The bar is an example of getting what you pay for. It is made out of treated pine and will probably only last a summer season or two providing you cover it the rest of the year. It was easy to put together but there were two holes that I had to re-drill as they missed the connecting spots. The color is much more yellow than the photo shows. In fact it is so garish and hideous of a color that I am having to paint it. On the upside, painting it may allow it to last another season longer. I bought this bar because it is the right size and design for my patio. I would gladly have paid three times the amount if it were made of a hardwood such as teak or mahogany which would have looked beautiful and lasted for many years with proper care.. Rated 4 out of 5 by Bunny from Its nice but not too sturdy like I hoped. It has a nice finish look and wood is a nice color. Its nice but not too sturdy like I hoped. It has a nice finish look and wood is a nice color. Rated 4 out of 5 by Katiebell from Easy to assemble and sturdy. The finish is not... Easy to assemble and sturdy. The finish is not the best. The finish should have been applied several more times. Due to the poor finish I am going to Whitewash the table. Rated 1 out of 5 by Angela from Pieces of the bar cracked/broken. Manufacturer contacted by Home Depot... Pieces of the bar cracked/broken. Manufacturer contacted by Home Depot and myself with no replies from the company. Rated 4 out of 5 by Dardrew from Perfect for what we wanted. This is the perfect little bar for our back porch. It would need additional bracing if people were sitting at it and leaning on the top but otherwise it is great. Very good priceand perfect size for what we needed. Rated 2 out of 5 by Doublepen from Bar looks good! After receiving the shipment I assembled the bar which was very easy. However, after assembly the top of the bar is very week and if someone leans on the bar the top sags with very little weight. I put support brackets on all four corners to help with this problem! Rated 1 out of 5 by Dennis from Have spent 30+ on fixing it/adding pieces This item isnt available in stores. Therefore it has to be shipped. Well, when i opened the box, pieces were cracked and assembly was not easy. I have since added support members, shelf brackets and a sheet of 1/4 inch ply on the top just to make it sturdy enough to use.